For the past month I have tossed around the idea of giving out annual literary awards on my blog. You know, like the Newbery Award or the Caldecott. Or, in the pop culture world, a Grammy or an Oscar. Friends even helped me brainstorm what I might call an award given from one word-nerd to another. But then I realized, that I don’t have enough money to create and produce little idols of gold, and really, would presenting my real, live and breathing idols miniature statutes really convey how much their words and work mean to me? Probably not. And then there came the whiny voice of reality, showing up, uninvited, in the form of an internal monologue. Who really cares what some geeky girl in Wisconsin thinks? What credentials do I really have to go about claiming anyone’s literary gifts are greater than any others? So, I’ve abandoned the idea of creating my own literary award. But alas, I have not given up entirely. What I really would want to communicate to the writers that have “spoken” to me this year, is that I value their efforts. I would want in some way to say thank you for allowing me to learn from them. I would want to say thank you for making the thoughts inside their heads visible and tangible. I thought all of this over and wondered. How could I possibly communicate my gratitude? But anyway, I digress. If I were to throw a dinner party, for the writers who most inspired me and won my admiration in the year of 2017, here is who I would invite. Kimberly is the author of several amazing historical fiction novels, but most recently The War I Finally Won (a sequel the Newbery Honor winning: The War That Saved My Life). Kimberly’s writes about controversial topics in a way that is appropriate and accessible for middle grade audiences, a skill I am very eager to improve in my own writing. In addition to this amazing feat, she manages to write in a way that is heartfelt and honest. Her books often induce reflection, tears, wonderment, joy, curiosity and a dozen other deep reactions. Outside of her novels, Kimberly blogs excessively, sometimes posting several times a week. (I blog weekly and know what a big accomplishment this is! Good job Kimberly!) In these blogs she talks about her work and life, about our world, and about her work and life in our world as a real human being. Kimberly talks bravely about politics, religion and current events, and again, she does so with heart and honesty. I am so grateful for her voice of truth, specifically because her blog posts have taught me that just because I mostly write for young audiences, doesn’t mean that I can’t have (and share) adult feelings with the world. She doesn’t need another accolade to sit at my dinner table, but she’s got them in spades, including volunteering. Her current project is renovating a library for low-income children in the Appalachian Mountains. Kimberly, I thank you for your words, they are changing the world… for good. 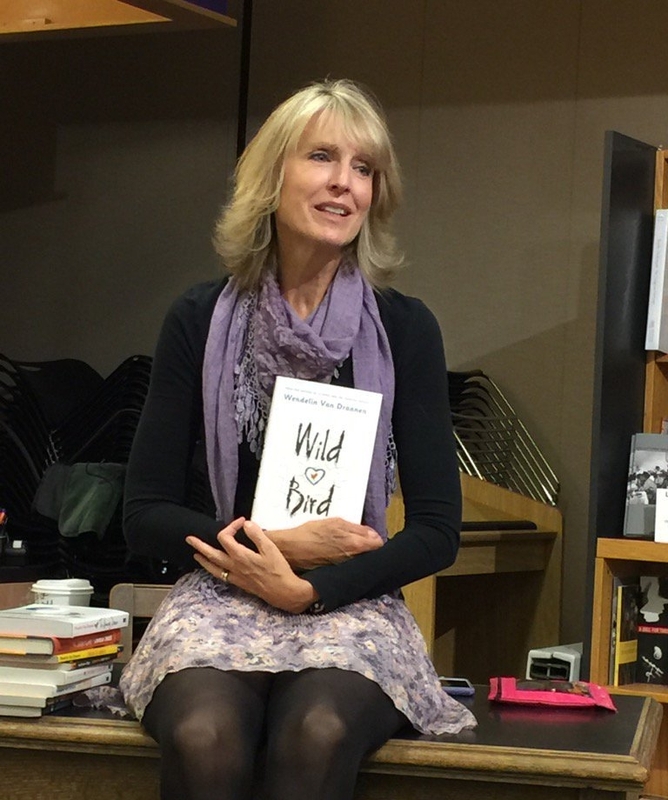 Wendelin has written a bunch of amazing books (The Running Dream, Flipped, The Sammy Keys Mysteries), but this year she published my new favorite Van Draanen book, Wild Bird. Word nerds… you have to read this book. It is about the dangers of loneliness and isolation. It is about the struggles young people face. It is about the power of a strong will and a family’s love. It is something every middle schooler, parent and teacher should read. It is a book that I bought four copies of, three of which I gave away to students in situations similar to the main character, Wren. When I told Wendelin what I was doing she sent signed book plates and feather bookmarks to help me make an even bigger impact. I shouldn’t have been surprised. Do you know what Wendelin does on a daily basis? She walks around with copies of her books, and gives them away! No begging for book sales from this woman. She spends her own money, putting words in the hands of young readers, simply saying: “You’ve been booked!” The videos of her handing out books at Halloween (with a mask on, so the people won’t know who lives in the big house at the end of the long driveway) are hilarious. And when people won’t make the trek up to the big house at the end of the long driveway, she takes to the streets, handing out books to all that she encounters. I admire Wendelin’s passion. It is always my goal for people (students, readers, workshop participants) to love words just a little bit more after spending time with me. I think I could learn a thing or two about this from Wendelin as we share a meal together. Somehow, I get the feeling she’d be generous with her advice and wisdom. 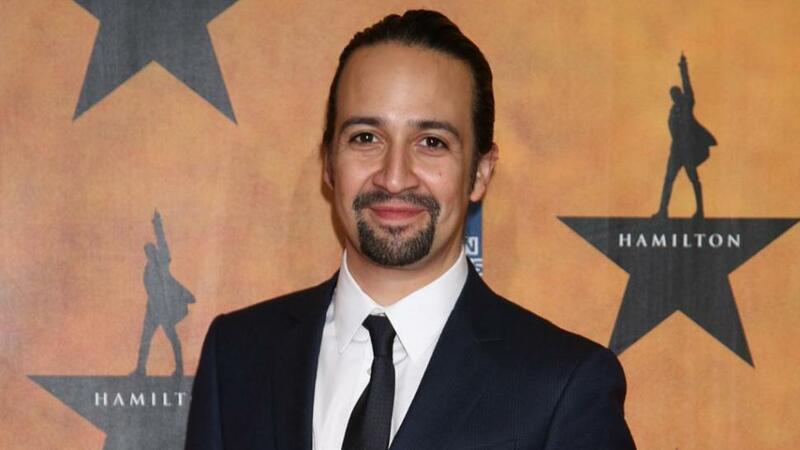 I know, everybody and their brother wants to eat dinner with Lin-Manuel. As a social studies minor, a lover of witticism and a fan of music… this incredibly intelligent man would add volumes to my fictitious literary dinner party. The soundtrack of Hamilton was a constant presence in my car this spring and the musical skyrocketed straight to the top of my favorites list after I saw it performed in Chicago this summer. Now, quotes of the musical hang in my classroom. What most impresses me about Lin-Manuel is his ability to present old information in a new way. I also am envious of his ability to turn a phrase. When compared to the other writers on this list, his work and life differ from my own more dramatically. Because of this, I would probably be the most nervous around him, but hopefully after a glass of Moscato, I’d be able to leave my star-struck nervousness behind and adeptly discuss the work of infusing historical facts with literary genius. It would come in handy as I attempt to tackle a new idea in 2018… a story that takes place in a land familiar to the Founding Father he knows so much about. The Roaming Poet is used to talking to strangers. He does it for a living. 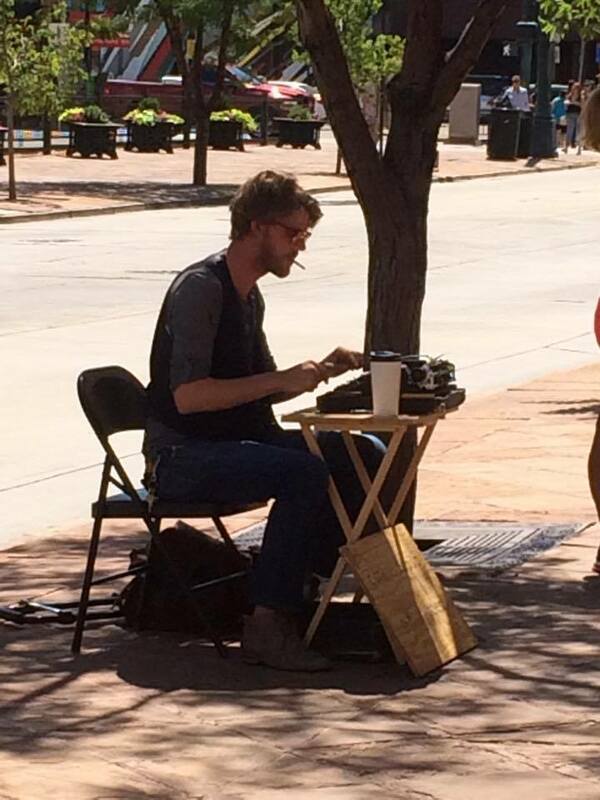 He parks himself outside of bookstores and writes poems for passersby. Give him a topic and a few dollars and he’ll give you a poem. I met The Roaming Poet in Denver, his home base. As we chatted he told me about all the places he had been in the last year, the types of poems he had written, and about the poems that had been commissioned and left behind. This man taught me that really, if you want to do what you love for a living bad enough… you can. He taught me that you can quit the practical day job, get creative with how your life and finances work, and be happy crafting your new life one line, one stanza at a time. The Roaming Poet would bring a plethora of conversation topics and national perspectives to the table. If we were lucky, he might even write a poem describing our dining experience, so that I could forever remember the magical evening that I spent with my word nerd heroes. I’ve waxed on plenty long enough. If this were a real awards show, they would have already started playing the background music and be attempting to usher me off the stage. But, I would be remiss if I didn’t quickly mention my affinity for Kate DiCamillo, J.K. Rowling, Jennifer Wiener, Mark Parsons and Helen Frost and the positive impact that they have made to my reading and writing life this year. Thank you, authors extraordinaire, for your words and your belief in a story well told. Thank you for sharing your life and writing lessons with me in the form of novels, blogs, audiobooks, Facebook posts, interviews, tweets, and email responses. Kimberly Brubaker Bradley, Wendelin VanDranned, Lin-Manuel Miranda, The Roaming Poet, Kate DiCamillo, J.K. Rowling, Jennifer Wiener, Mark Parsons and Helen Frost… you are my champions. If I could give you a golden statue to prove my admiration, gratitude, appreciation, thanks and love… please know that I would. It might even be too big to place on the mantle. Instead, I offer you what you have given me… words.